The Root House – Keynedon Barton, Sherford, Nr. Kingsbridge. The name Sherford is first mentioned in 1018 and in those days it was known as ‘Scire-Ford’ meaning ‘Clear Ford’ in Anglo-Saxon. 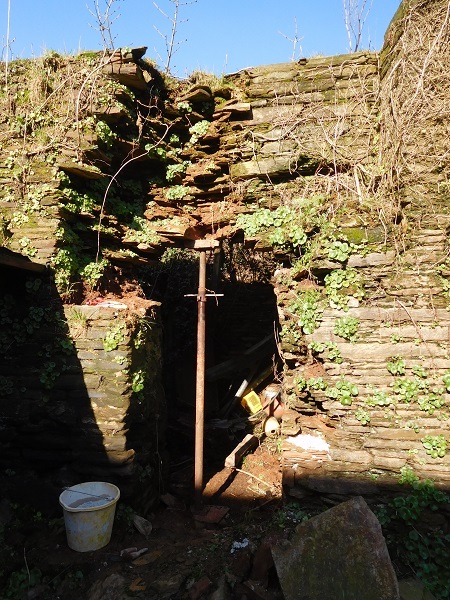 The farmhouse itself can trace its origins back to sometime during the mid 13th century or even earlier and the 340 acre farm is still in working use to this day. It is one of the oldest farmhouses in Devon. Keynedon, which is pronounced ‘Kennedon’, derives from the Old English name meaning ‘the hill of Coena’s people’. The word ‘Barton’ is historically synonymous with a feudal demesne in the English West Country, now typically meaning a large farmhouse or the manor house. Keynedon Barton has been well documented since the middle of the 11th century. 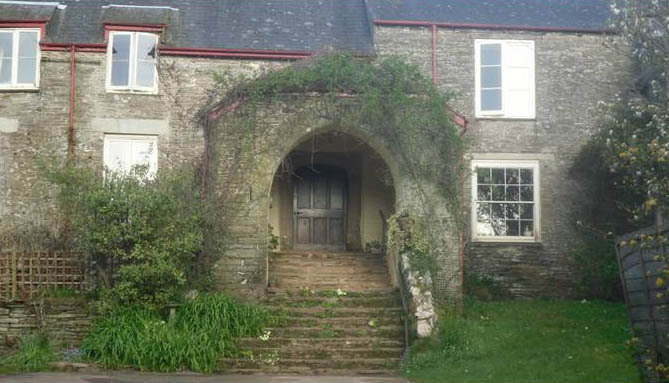 Around the beginning of the 14th century it was owned by the Halse family up until 1684 A.D. It is this family that was responsible for many of the surviving features of the house and surrounding buildings that we see today. This was once a high status quadrangular style manor house containing mock-fortified outer walls with crenellated battlements and inner courtyards. Arched gateways or gatehouse type entrances were also built here along with towers. 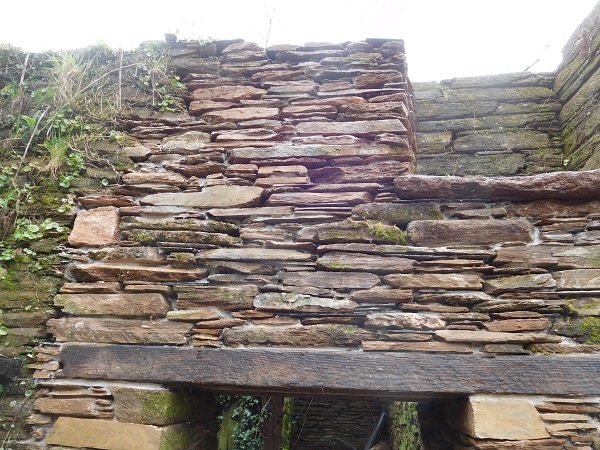 Much of this work was constructed using high quality slate ashlar which had all been dressed by hand using an axe and the stone came from an old quarry at the rear of the manor complex itself. 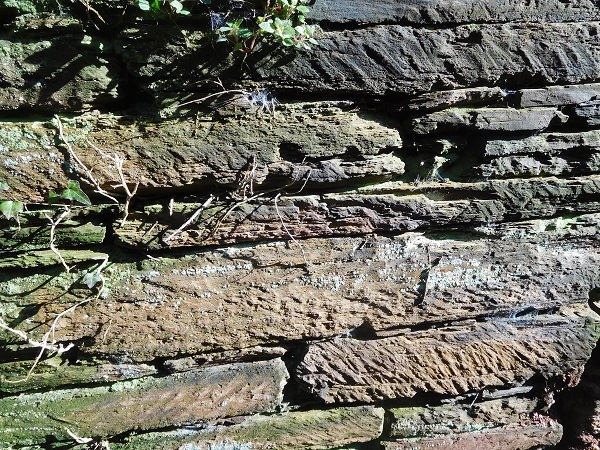 We have carried out several jobs here over the years, one of them involved the rebuilding of an old wall that once formed part of a causeway, and the other was a retaining wall. 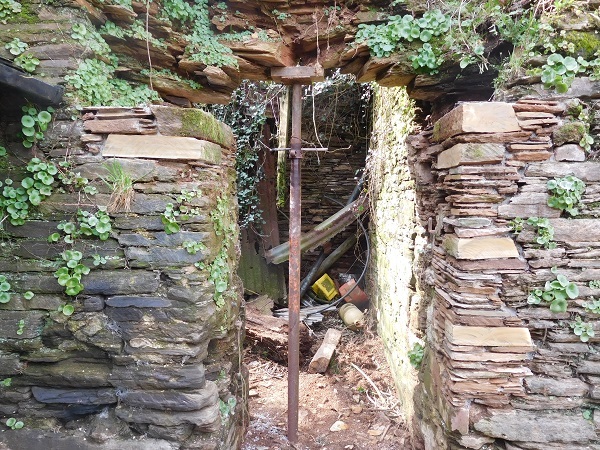 This time though we were asked to take a look at one of the out buildings which was the old ‘Root House’. 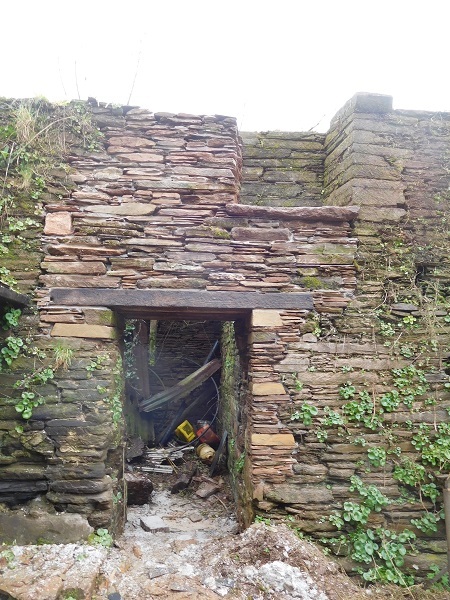 Oak lintels above the door leading into the root house had rotted out completely where some of the stonework had already fell down placing the rest of it at risk of further collapse. 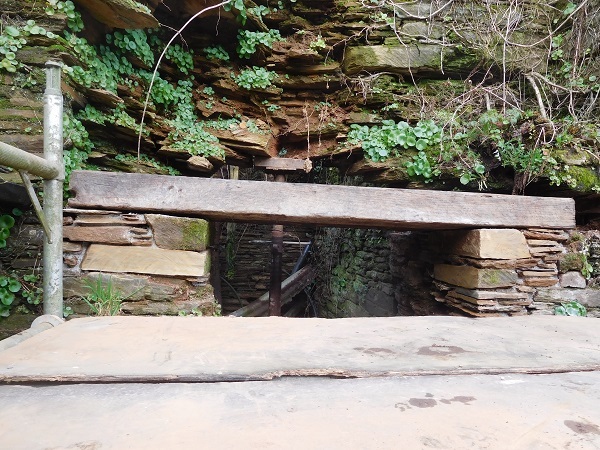 The first task was to make sure the stonework was safe and wouldn’t fall down on us, so a prop was put in place to keep it up. The right hand reveal had also collapsed and this had to be built up to height to take the new lintels. 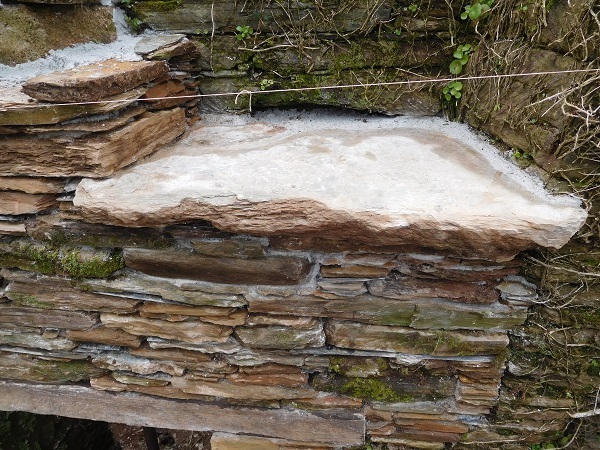 Original stone and traditional lime mortar was used for the task. And the top of the left hand side had to be built up too. When this was completed a small tower scaffold was erected and new oak lintels were set into position. 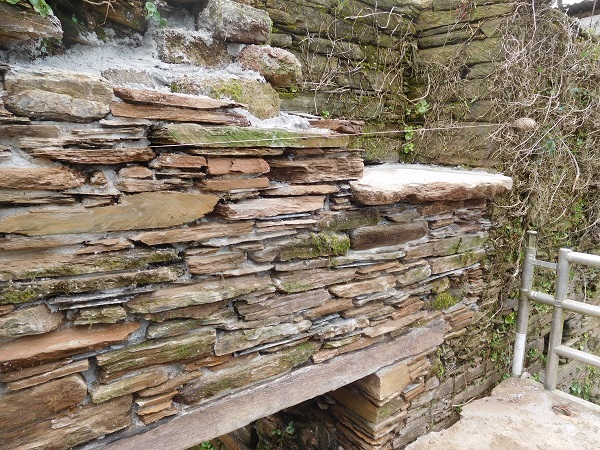 We then proceeded to build the stonework up above the lintels. Part of the section of wall above the lintels included a window opening which had been closed up in stone sometime back in history. It had splayed reveals whereas the stone had all been dressed by hand with an axe. 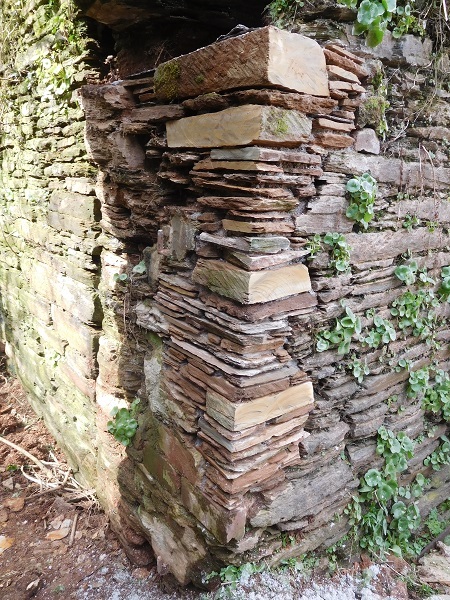 It was decided to maintain this opening and a suitable piece of stone set in for the sill. The other opposite reveal was built as a splay to match. The tools of the stonemason have changed little over 2000 years and the ‘stone-axe’ is without doubt one of them with it probably being the oldest tool purposely made for the dressing and shaping of stone and is sometimes called a ‘tallion’. We know that the Egyptians used axes and later the Romans and it was the main tool used by stonemasons for shaping stone up until the Medieval times. These axes come in all shapes and styles with various cutting edges and when used correctly they can be pretty accurate and very efficient at removing stone. You’ll find a great many stones in historic buildings with these distinct tool markings applied to them. Although not used much these days in Great Britain, the axe is still a tool that is widely used all around the world. 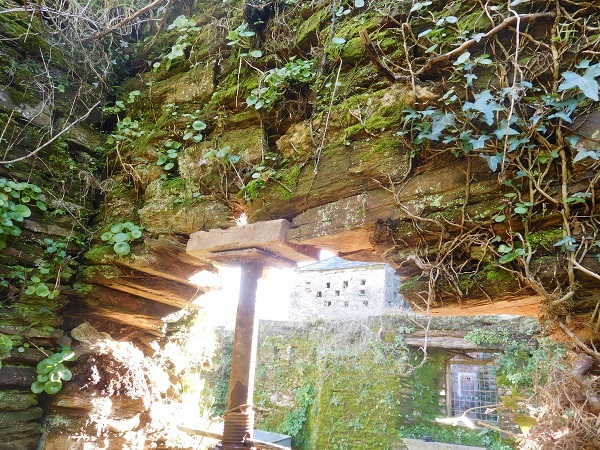 The roof over the root house had collapsed more than seventy years ago after a fire and had never been re-instated leaving it open to all the elements. Having no roof to keep the tops of the wall dry had most certainly contributed to the wall deteriorating over the decades and Mother Nature always prevails. Nevertheless the remaining walls were still Grade II listed by English Heritage and any repairs here had to be done right. Historically a root house or root store is typically a room or cellar for storing root crops, which were widely introduced as part of improving crop rotations and for the feeding of cattle in farmsteads from the late 1700’s. Typical features include a room which are usually incorporated within cattle housing or a combination barn, or as a separate building. The latter are more easily recognisable and appear to be concentrated more in the North-East of England. 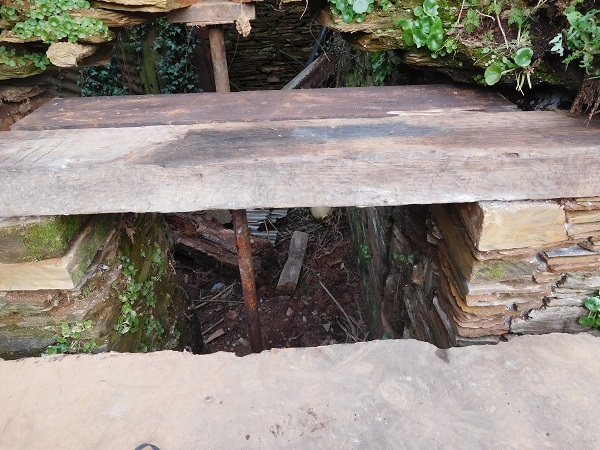 Earth covered root stores are found in the Pennines and the moorland fringes of Devon and Cornwall, either on farmsteads or completely isolated. These structures kept their contents within from freezing in the Winter and cool during the Summer. Other crops may also have been stored in these buildings such as fruit and vegetables which were vitally important during the Winter months. Modern day refrigeration has now rendered these types of buildings obsolete, although people do still use them in some parts of the world.